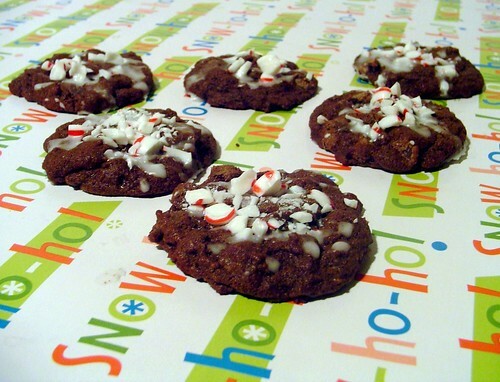 Chocolate Peppermint Cookies – Elly Says Opa! It’s a good thing these cookies are tasty, because they made me lose my F ‘ing marbles. Normally I am able to do all my baking or baking prep over a weekend but because of the holiday schedule this year, it bled into part of the week. Since I planned on assembling goodie boxes on Tuesday night, I decided to prep as much as possible before then, since a lot of actual baking would be involved on Tuesday (to keep things as fresh as possible). So, I decided to make this dough on Monday night and refrigerate it. Well, apparently that was much easier said than done. For one thing, trying to soften butter in my insanely cold apartment is nearly useless so even though I let the butter sit out all day I was at work, it was still a rock when I came home. So, I put the butter on my stovetop (because it is also like 30 years old and randomly gives off heat even when it’s not on) where it softened relatively quickly and I got to cookie dough making. I had creamed the butter and sugars and was about 1/3 of the way done adding the cocoa/flour mixture when the bowl with said cocoa/flour mixture started flying through the air and I scrambled to save it in very dramatic fashion. Too bad it didn’t work. So there was cocoa and flour everywhere. On my clothes, on the floor, on the rug, the counter. I couldn’t even pick it up with a vacuum, it was so bad. And of course the entire batch had to be scrapped because I had no way of knowing how much flour actually made it into the wet ingredients. In case there is any question, this is not a fun experience to have–ever–but it is certainly even less fun when it’s 10pm and you are already stressed about all you have to do. Needless to say that whole “don’t go to bed angry” thing SO did not apply to me. I’m submitting these over to Susan, the lovely FoodBlogga, for her Eat Christmas Cookies event. Be sure to change the constantly-updated round-up! Cream together the butter and sugars until fluffy, about 3 minutes. Add eggs, one at a time, and beat until just incorporated. Add vanilla. Scrape down the sides of the bowl and mix for a few more seconds if necessary. On low speed, beat the flour mixture in a little bit at a time (and seriously, do not drop it). Stir in the chocolate chips. Drop dough on an ungreased cookie sheet, with cookies about 2″ apart. Bake for 8-10 minutes (don’t overbake these things, so they stay chewy! ), until just cracked on top. Set aside to cool completely. To make the glaze, stir the sugar, extract and milk together in a bowl until smooth and of good glazing consistency. If you want, you can stir in the crushed peppermints at this point, or you can just glaze each cookie and then top with crushed peppermints before the glaze has set.